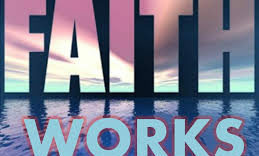 Faith or Works, or Both? The title of this lesson is ” Justification By Faith, Perfected By works”. But let me explain exactly what is meant by that.. The justification that God gives to a person, is because of their faith, which has been “perfected”, or “made complete”, through their works. The word “works” simply refers to deeds that are done. But I’m not talking about doing just any deeds. I’m talking about doing the deeds which are done, in obedience to the words of God. No word of God will ever be given to anyone, except for the words already given in the bible. Let me reverse that statement, and phrase it a little differently, just to make sure we totally understand it..
God has already given to us, everything there is, pertaining to life and godliness. It’s already been done, we already have it, right here in the bible! Since God has already given us “everything”. Everything pertaining to life and godliness that is. There’s nothing more to give. No one is ever going to receive another revelation from God. No one is ever going to miraculously led by God. God has already done all the “leading” He’s gonna do. Now it’s up to us to do some following! But now God wants us to do something else, so that His grace, and His peace, can be multiplied to us. And do you know what God wants us to do? 2 Peter 1, verse 2 & 3 told us what he wants us to do. Peter said; “Grace and peace be multiplied to you, in the KNOWLEDGE of God, and of Jesus our Lord.” God wants us to gain knowledge! And ALL the knowledge that we could ever need, is right here in the bible! God wants us to know, everything, that He has revealed to us. And if we’re not doing all we possibly can, to come to that knowledge, then we’re not doing God’s will! Plain and simple, we’re not doing God’s will! That sounds to me, like a virtual “guarantee”, that if you will be faithful to God, and if you will be one of His “righteous ones”, that you will never have to worry about having enough to eat. I read an estimate, that about 795 million people, or about 12.9 percent of the worlds population, are undernourished. Many are literally starving to death! But not God’s children. But children, and adults, in various parts of the world, are starving, and we’re told that that’s a fact. And if we couple that fact, along with the fact that the bible says; “I have never seen the righteous forsaken, or His descendants begging bread”, we see how desperately, Christians need to get the word of God, to everyone alive! We’re all familiar with Romans 10:17, which says; “So then, faith comes by hearing the word of God.” But you know, as well as I know, that “hearing” the word, implies “knowing” the word. You don’t have to literally “hear” the word, you can “read” the word for yourself, and it will still produce the same faith, as if you “heard” someone else read it. The point is; You must KNOW the word, in order to acquire faith. No one has faith simply because the word exists. Faith comes by “knowing” the word of God! And Jesus said in John 8:32; “..You shall know the truth, and the truth shall make you free.” Jesus was talking bout being free from sin, wasn’t He? Is that all there is to it? Just “know” the truth, and you’re free from sin? A lot of times, the bible uses one word, to represent something more detailed than the one word actually describes. In grammar, that’s called a “synecdoche”. It’s when a part of something, is used to represent the whole thing. For example; The phrase “all hands on deck”. The word “hands” refers to the whole person. You don’t want just their hands on deck, you want the whole person. Well, that’s the same as when Jesus said; “You shall know the truth, and the truth shall set you free.” It’s not just the knowing of the truth, that sets us free from sin. It’s the knowing, and the believing, and the obeying of the truth. But the word “know” is used to represent the whole thing. Whether or not we are eternally saved, depends on what we do with our knowledge. You can have so much knowledge, that you can quote the bible, front to back, and still be lost. So then, once again, our salvation, is not the result of anything that we could do on our own. “With men, it is impossible..” But with God, it’s a reality. All we need to be saved, is knowledge of the truth, and the faith it produces, and the deeds which make that faith complete. Faith doesn’t just believe, faith does! If you believed that the ceiling right above your head was going to come crashing down, you’d probably move. If you didn’t believe that was going to happen, you’d stay right there like you are. It all depends on what you truly believe. If you truly believed that Christ was coming today, you’d probably start praying right now! And you might be doing a little repenting also. But if you don’t believe that He’s coming today, you might just put off that repentance, for another day. Why would anyone call Jesus their “Lord”, and not do what He tells them to do? Well, it’s because they really don’t believe in Jesus, and in what he says. They don’t trust Him. That’s why! But you see, Abraham believed God, and he trusted God. “He considered that God is able to raise men even from the dead.” And so when God told him to offer Isaac, as a burnt offering, he did it! Remember what it says in Genesis 22:3? “Abraham rose early in the morning..” He got up early, and started to do what most people wouldn’t do in a million years, but Abraham “rose early in the morning”, to kill his son Isaac! Because God told him to do it! And Abraham believed that God would somehow, make it all work out! That’s quite some faith, isn’t it? And we sometimes struggle to have enough faith to do the simple things that God has told us to do! Sometimes it’s hard to believe what little faith we actually have! “O ye of little faith”, Jesus said, more than once, to His disciples. You know He thinks the same thing of us sometimes, don’t you? You know He does. But when we do “muster” enough faith to actually DO, what God has told us to do, THEN, our faith is made complete! Then our faith is reckoned to us, as righteousness! That’s what the bible says about Abraham’s faith. What a tribute, to be called “the friend of God”! I hope that we can be called God’s friends. I hope that when we read what God tells us to do, that we’ll do it! No questions asked, and no misgivings about it, but that we just “do it”!